Glorious sunshine shone all over the May Bank Holiday weekend for the prestigious Victus Tour of Ulster which saw teams making up the 130 riders come from all over to compete in this 3-day race based in Banbridge. Simon Curry took charge of the Banbridge Team which consisted of Roger Aiken, Gareth McKee, John Buller, Kevin McKinney and Marcus Christie. This year we were delighted to have our new team car, supplied by JP O'Hagan and Federal Tyres. Also supporting the team once again was Cycleology who provided the lads with sports nutrition and energy products for the weekend. The first stage made its way with a relatively flat course, anticlockwise around Lough Neagh with the final KOH in Rathfriland Hill, covering a total of 112 miles on the 1stday. Stage 1 was won by Holdsworth Pro Cycling Team rider Conn McDunphy who was home and guesting for the Lucan Dublin Cycling Team. Local riders had a good day with Lindsay Watson from Powerhouse finishing the day in 4thplace, Banbridge CC’s John Buller, who’d just joined the senior ranks this year, put in a terrific performance finishing the stage in 9thplace with the ever-consistent Gareth McKee in 30th position. Stage 2 was a tough day covering climbs at Spa, Slieve Croob, Rathfriland Spelga and probably the most difficult climb of the race at Windy Gap. Crowds of local supporters were present in the glorious sunshine to witness the sterling efforts of the competitors as they made the strenuous climbs. After covering 100 miles the race headed back to Banbridge. 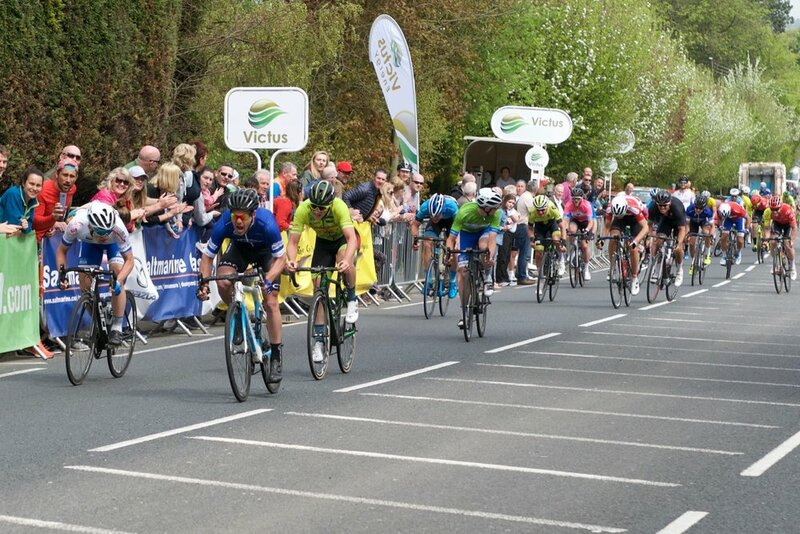 There was an exciting photo-finish on Newry Road, where the winner was declared; ex-professional Ronan McLaughlin from Team Viner Caremark Pactimo, by the very finest of margins. A brilliant effort from the Banbridge Team with guest rider Marcus Christie, who has just returned from the Australian Gold coast where he achieved a top 10 at the Commonwealth Games, finishing in 20thplace. John Buller finished in another fine 23rd. The King of the Mountains Competition was won by local rider Lindsay Watson, Powerhouse Sport, a very strong performance from Lindsay over the steepest of climbs in Co Down. Stage 3 was a 10-mile circuit covered 7 times. The circuit itself starts along the Newry Road and takes a right onto Tullyear Avenue, left onto Old Newry Road and right onto Ringsend Road and moving onto Ballygowan Road, Coolnacran Road and Legananny Road before entering the town of Loughbrickland. The race then takes a left onto the Grovehill Road, followed by another left onto the Ballynanny Road and them onto the Brague Road before returning onto Rathfriland for a fast finish into Banbridge. This circuit really saw the crowds come out on Bank Holiday Monday to cheer on the international line up of cyclists, lining both sides of the Newry Road. The Banbridge CC team had a plan laid out and, led by Roger Aiken, who was putting in spectacular turns at the front of the race whittled down the breach of the day which contained fellow Banbridge team mates Buller & McKee. It was a valiant effort that was only closed down in the final 5km of the race, which set up for bunch sprint finish up the final drag of the Newry Road. There were loud cheers as Italian rider Matteo Cigala from Team Viner Caremark Pactimo crossed the line in 1stplace, his first tstage win in the Tour of Ulster after a string of 2ndplaces from previous visits. The Victus overall winner from the three days of racing, was Joe Evans from St Piran, Cornwall, with Scott Auld from French Club, VC Toucy in 2ndplace. local rider John Buller of Banbridge CC finishing in 9thplace overall on general classification, the 19-year-old had an amazing 3 days in his first major race from leaving the Junior category. Guest rider for Banbridge CC, Kevin McKinney, finished overall in 24th with Gareth McKee in 42nd place. Lindsay Watson from Powerhouse Sport finished in 17th place and a strong performance from young Brandon Douglas guesting for Dromara finished in 67th place unfortunately Jack Ferguson from Dromara crashed out on the 1stday and Nathan Mullan, also of Dromara CC was listed as a DNF on stage 2. A terrific international event over 3 days and with 130 starters. All of our local riders did Banbridge proud. This event would not have been possible with the volunteers, marshals from all our local clubs and the assistance of the PSNI Road Policing Unit so a huge thank you to them all.